Although marine studies in Azerbaijan date back to late 19th century, the establishment of Azerbaijan State Marine Academy during the years of independence was the start of a new era in the development of marine studies. Although the history of maritime education in Azerbaijan commences since the end of XIX century, The Azerbaijan State Marine Academy was created during the independence era. It brought maritime trainig to a new level. The republic`s leader, Heydar Aliyev, understood the importance of a higher education institute to train highly skilled marine specialists for Azerbaijan as a maritime state. It was on his initiative and by the decision of the Cabinet of Ministers of 15th July 1996 that the Azerbaijan State Marine Academy was established on the basis of the Baku Seafaring School. The new academy was set up to train sailors to work both on the Caspian and in international waters. 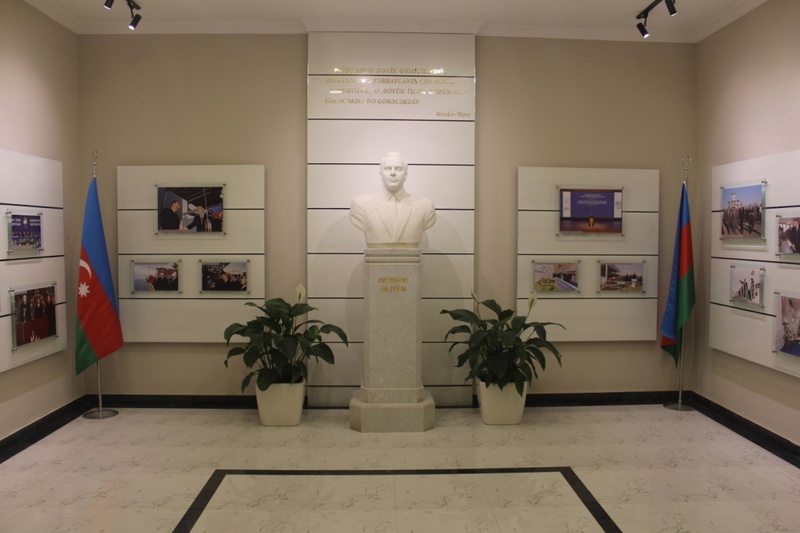 The Academy made its contribution to Great Leader Heydar Aliyev`s policy of making Azerbaijan known in the world: from day one it designed the education process to meet the requirements of the International Convention on Standards of Training, Certification and Watchkeeping for Seafarers (STCW), adopted in 1978, to which Azerbaijan is a party. For this purpose, curriculums over all specialties, syllabuses and state standards of education were re-designed and duly approved and accepted by IMO. 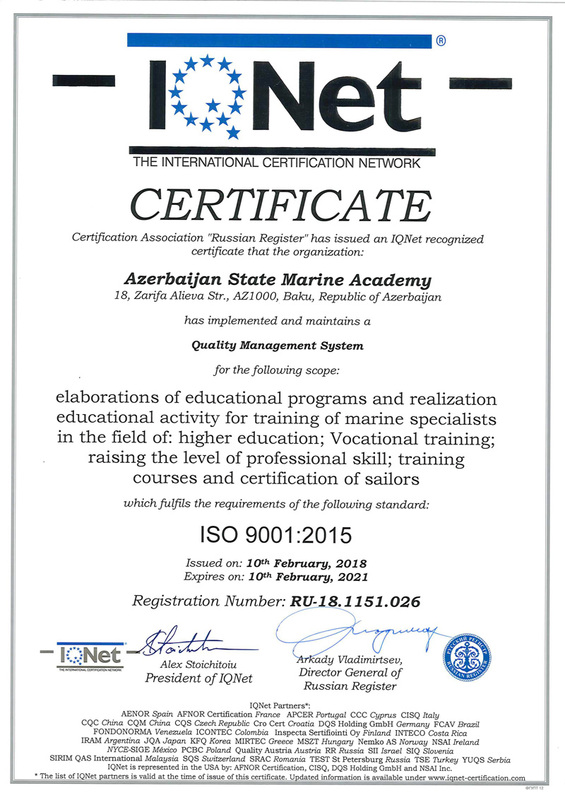 The Azerbaijan State Marine Academy was included on the IMO Marine Educational System`s White List under registration number 012. Academy’s diplomas are officially recognized in more than 170 countries of the world. It is a member of International Association of Maritime Universities, as well as, a member of the Academic and methodological Council of CIS Countries` marine institutions operating under the aegis of the Admiral Makarov State University of Maritime and Inland Shipping, St. Petersburg. It is also an active participant of the Association of Higher Education Institutions of Caspian Littoral states and is collaborating with 18 universities from 11 countries. International partner universities of ASMA are: Astrakhan State Technical University, Novorossiysk State Marine University named after F.F.Ushakov, State Marine University named after Nevelski, as well as Szczecin Maritime University of Poland, Latvian Maritime Academy, Estonian Maritime Academy, Montenegro State University, Bulgarian Varna Technical University, Ukrainian National Shipbuilding Academy named after Admiral Makarov, Kiev State Water Transport Academy named after hetman Petro Konashevich-Sahaydachniy, Caspian State University of Technology and Engineering named after S.Yesenin, Batumi Maritime Academy and Batumi Navigation Education University of Georgia, Klaipeda University of Lithuania, Istanbul Technical University of Turkey . At the same time, Azerbaijan State Marine Academy is closely collaborating with Lithuanian Informacine Raida, JSC and Turkish “Turksen Eğitim Ltd”. 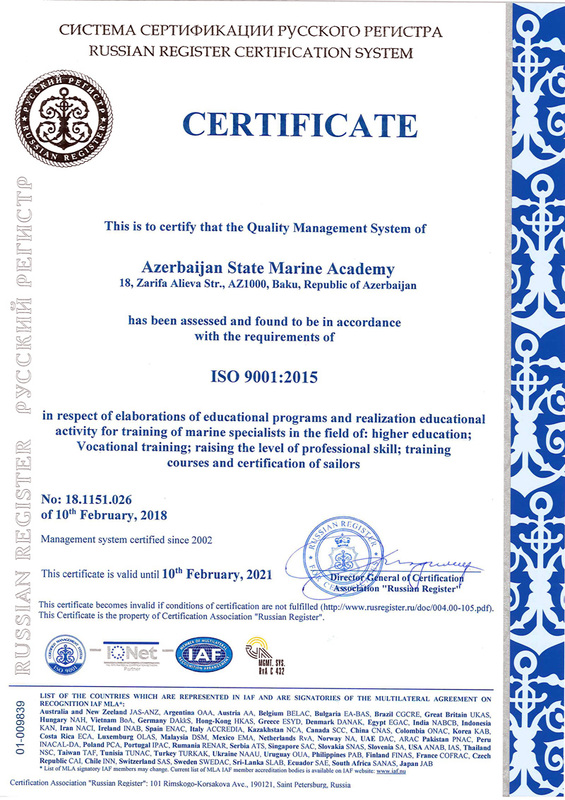 The policy of quality management in ASMA is followed by unconditional compliance with national and international standards, norms and guidelines for the training and education, as well as working processes, management of simulator centers and re-training of specialists in the sphere of marine transportation and encompasses all levels of the organizational activities in the Academy. Policy in the sphere of quality is grounded on Quality Management System which is being effectively implemented at the Academy. The Academy has performed the process of training the seafarers under ISO 9001:2000 International Standard since October, 2002 and ISO 9001:2008 Standard of quality management system has been implemented since 2010. Since february 2018 till now ASMA is operating under the renewed (prolonged) certificate of ISO 9001:2015 Standard. 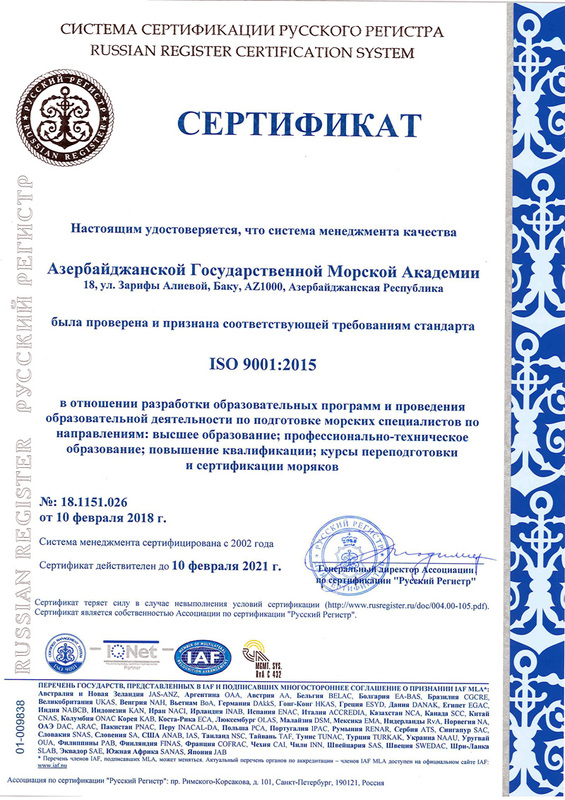 As the result of the audit of Academy’s Centre for Training and Certification of Seafarers held by American Bureau of Shipping (ABS) - one of the most reputable classification societies in the world, the compliance with the "Standards for certification of educational facilities and training courses" was approved and thus, ASMA obtained ABS compliance certificate in February 2016. All these guarantee the high quality of preparation and training of professional seafarers and full compliance with national and international standards. At present, the education process of high-quality and conforming the most modern educational standards is established at all the educational levels (bachelor, master and PhD) in the Academy. Currently, there are 2 faculties and 6 departments at ASMA. At present, about 1000 students are studying at the Academy and 6 professors, 30 assistant professors, 47 senior teachers and 17 assistant teachers are involved in education and discipline process of the students. Admission is held over the following specialties: "Marine navigation engineering", “Shipboard power plants operation", "Electrical systems engineering" and "Shipbuilding and ship repair engineering". For the moment, students from foreign states as Russia, Turkey, Georgian Kazakhstan and Ukraine are also studying at the Academy. Alumni of the faculty are employed at the ships sailing not only on Caspian Sea, but also seas and oceans throughout the world, as well as at leading international companies, ship repair facilities and shipyards. Specialists trained on “Shipboard power equipment operation” can find a job in the spheres of operation of vessel’s internal combustion engine and power equipment engineering. Besides obtaining high education diplomas, students are also provided with other relevant certificates during their education at the Academy which let them working as a ship mechanic and as watchkeeping mechanic in the local and foreign shipping companies. Alumni of Electrical systems engineering can work as electrics engineer on vessels. Engineering of management of transportation. Marine technique and technology engineering. Shipbuilding and ship repair technologies. Shipbuilding and ship repair dep. Graduates from "Marine navigation engineering" can find a job of captain or chief mate at ships sailing both on the Caspian Sea and in all waters worldwide. Specialists over "Engineering of management of transportation" can hold managerial and other similar positions such as logistician, coordinator, manager, dispatcher, freight forwarder, stevedore, surveyor, agent and technician at Port of Baku, international ports of the world, leading international companies, Transport departments, shipping companies, as well as at State Maritime Agency. Students studying at “Shipbuilding and ship repair” specialty will be able to find their career in projection works of vessels, their construction and repair, also as scientific workers, technician, constructor and at other relevant posts in scientific research institutes, shipbuilding and ship repair facilities. One of the tools providing an effective teaching process at the Academy is the training ship. 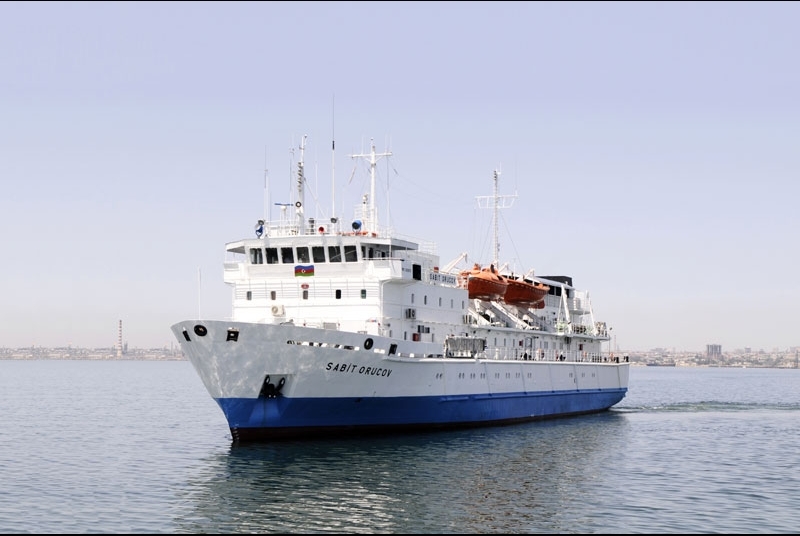 The ship is used for holding theoretical and practical classes, as well as, the externships for students studying at conventional specialties. Students of the Academy are both given practical classes on specialized subjects and undergone externships on the vessel "General Abbasov" which has been delivered at the disposal of students since September 15, 2015, and on the passenger vessel "Sabit Orujov" from 2017 and also on other vessels meeting modern standards, also in Baku Shipyard. Another tool that provides modern teaching in the Academy is the “Teaching ship”. Teaching ship is used when delivering theoretical and practical lessons and conducting field experience for the students studying for the conventional specialties. Our students are taught the speciality disciplines and undergo their field experience in “General Asadov” passenger ship which was put at the disposal of ASMA as a teaching ship from September 15, 2015, and in the other ships meeting modern international standards and in Baku Shipyard. 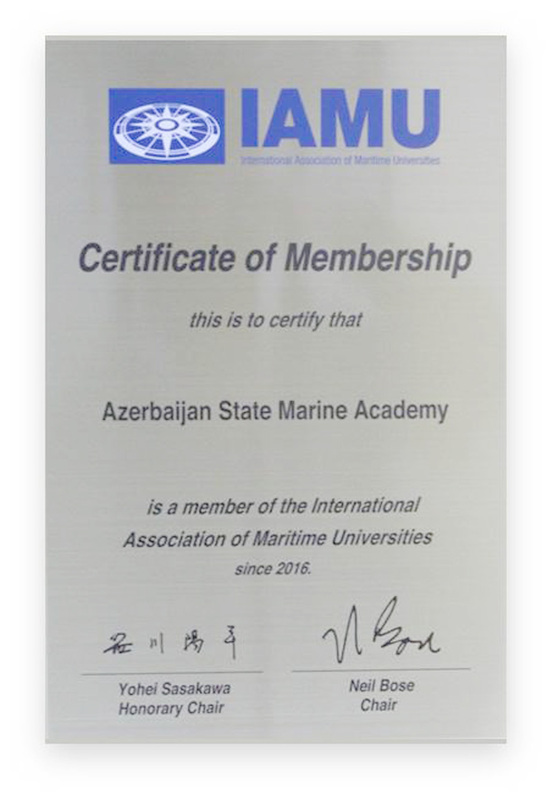 Azerbaijan State Marine Academy - member of a number of international marine organizations and host of relevant certificates, is expanding its activities in this direction time by time. Thus, classes over “Marine navigation engineering” will be held also in English beginning from the following educational year. Meeting the needs of the Caspian Shipping for highly qualified personnel is realized on the ground of quality in all fields of trainings. 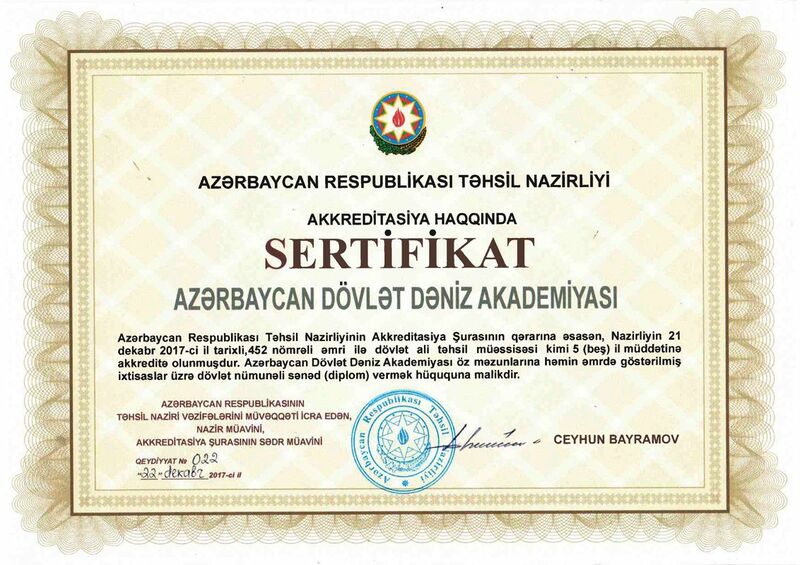 Academy, being the main human resource of "Azerbaijan Caspian Shipping" Closed Joint Stock Company, provides social defense and offers job opportunities for students with successful academic points. Such opportunities include employment (on the basis of warranty letter), career promotion, additional education, as well as the strengthening of social protection. Every year, a group of students from the Academy are sent to the ships sailing in the Black Sea to pass their externships. Academy also provides great opportunities of education in foreign maritime universities at the expense of Azerbaijan Caspian Shipping CJSC for the students passing through the appropriate selection procedures. The process of promotion of teaching, strengthening its unity with the science and industry is always kept on the agenda. The necessary atmosphere for productive working of teaching and learning staffs is created at ASMA. Students are provided with free places of stay in the fully renovated dormitory, free nutrition twice a day and free summer-winter uniforms. Direction of activities of the Academy is many-branched and is accompanied by the preparation of highly qualified seafarers, as well as their further training and improvement of professional skills. For this purpose, "Center for Training and Certification of Mariners" was established by the resolution of the Cabinet of Ministers no. 83, dated 08th of May 2000. Since 2014, training and certification of the seafarers working in various shipping companies of the republic have been carrying out by the Academy's Training Center. The main purpose of the Center is to train ship crews and personnel working at maritime facilities in compliance with the requirements and standards of the International Convention on Standards of Training, Certification and Watchkeeping for Seafarers, 1978 and its annexes. Training of the ordinary crew specialists over relevant specialties is also carried out at the Center. Training programs and methods of the Center were accredited directly by State Maritime Agency under the Ministry of Transport, Communication and High Technologies of the Republic of Azerbaijan and American Bureau of Shipping (ABS). 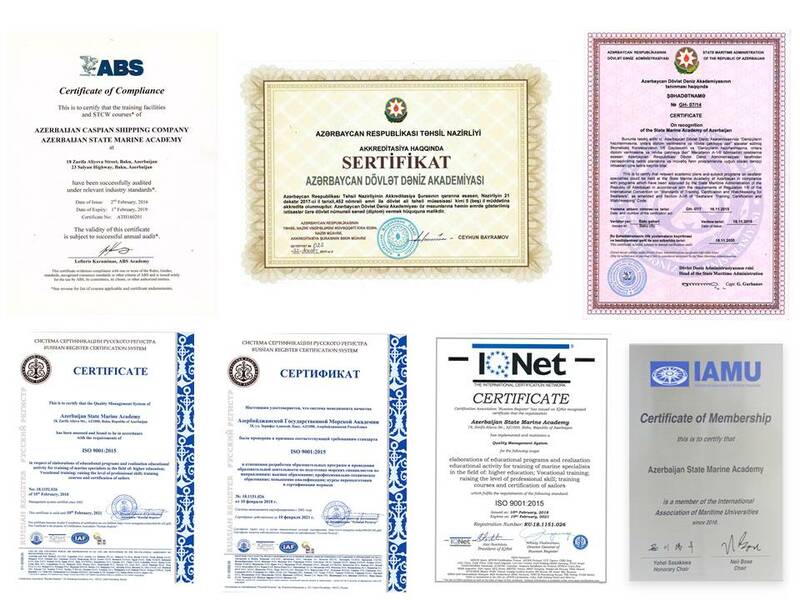 The Center has organized its working process under ISO 9001:2015 Standard and also has been audited and certified by “Bureau Veritas” International Certification Organization. According to the results of the inspection carried out by the delegation of Great Britain`s reputable organization - "The Nautical Institute" which was held on July 6-7, 2017, the Dynamic Positioning Simulator of the Center was issued a certificate. This certificate allows holding "DP Induction" and "DP Simulator" trainings at the Center. 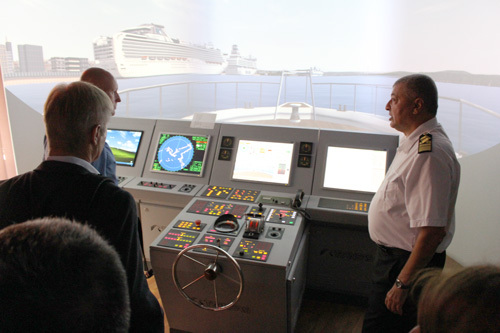 Dynamic Positioning Simulator is a computer-controlled system designed to keep the ship's position and the direction of the ship stable. So, the Center is currently one of 95 facilities in the world and only in Azerbaijan entitled to conduct DP Induction and DP Simulator trainings. As the fleet of Caspian Shipping is increasing day by day after purchase of new and modern ships, the educational process in the Academy is also provided with new simulators and network of laboratories at the same time. The process of supply with new equipment and simulators is being performed continuously for the purposes of ensuring the compliance with worldwide training standards. «Engine room simulator ERS4000», «NT-4000», «TQS» and «NS-3000» type simulators, meeting requirements of Regulation B-1/12 of STCW 78, have been purchased and used in education process since last year. At the same time, «Radar», «Navigation», «Electronic chart drawing» and «GMDSS» simulators, currently used by students, are great samples of the mentioned development. Gravity type AT rescue boat. “Global Maritime Distress and Safety System (GMDSS)” simulator (manufactured by POSEIDON and TRANSAS companies). “Radar observation and description, Operation of Automatic Radar Observation Equipment” simulator (manufactured by POSEIDON and TRANSAS companies). Simulator for "Operational Guidelines for Electronic Chart Display and Data Systems". "Fast rescue boat specialist" competency simulator (manufactured by TRANSAS Company). In order to train highly skilled specialists, Academy is continuously modernizing its material-technical potential and supplying its classrooms and laboratories with the most advanced technical and educational means. 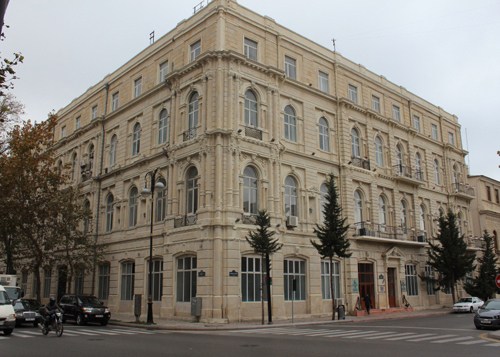 The new, four-floored educational building of the Academy was rendered to the use of students in 2016 after full restoration by "Azerbaijan Caspian Shipping" Closed Joint Stock Company. Upon establishment of Azerbaijan State Marine Academy on the basis of Baku Seaways School in accordance with the resolution no. 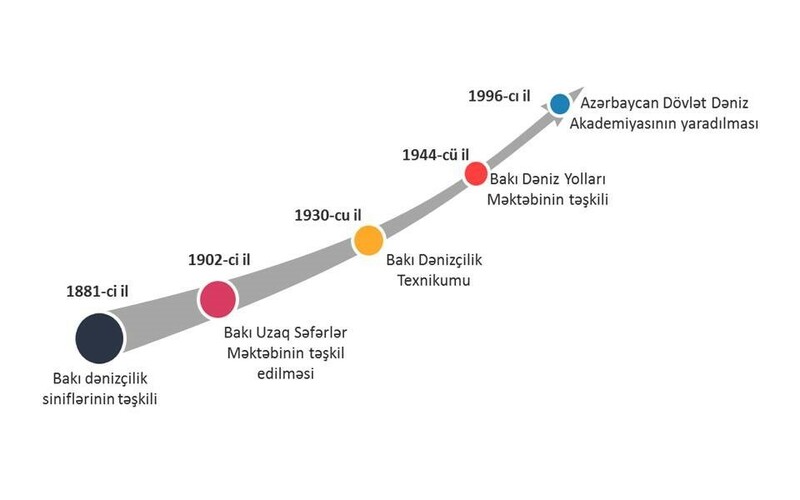 91, dated July 1, 1996, issued by the Cabinet of Ministers of the Republic of Azerbaijan, huge reorganization works also were performed in order to create the Scientific-technological library of the Academy conforming to the level of higher education institutions’ libraries. The Scientific-technical library encompasses a very rich literature fund covering all fields of maritime specialties. More than 80.000 books and other sources since the end of 1800`s have been assembled here. "Rare and precious literature fund", "Textbook fund", "General fiction fund", "Lecture fund", "Inquiry and data fund", "Scientific works of ASMA" are available for the use of readers. There is an "Electronic library" hall inside the library. Readers use the electronic library's INTERNET network to access the literature they need from different sources and other libraries, also use electronic versions of subject lectures, laboratory works and other teaching aids. Bibliography services are rendered to students, higher education teaching staff, masters and doctoral candidates in the Scientific-technical library of the Academy. Reading halls of the library were restored so that they comply with the modern international standards and equipped with new, comfortable furniture and computer technologies. 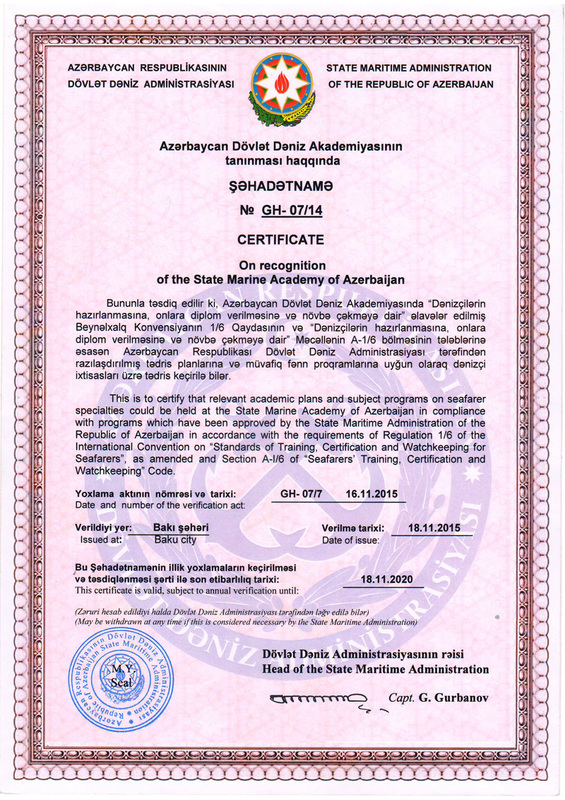 A new rector was appointed to Azerbaijan State Marine Academy which is the only educational institution in the region according to its profile, as per Executive Order dated July 24, 2015 of the President of the Republic of Azerbaijan Ilham Aliyev first time in the history of the Academy as a result of the care and attention of President of the Republic of Azerbaijan. The substantial structural changes and reasonable personnel policy successfully implemented by the new management allows to organize teaching process on a higher level in the Academy. 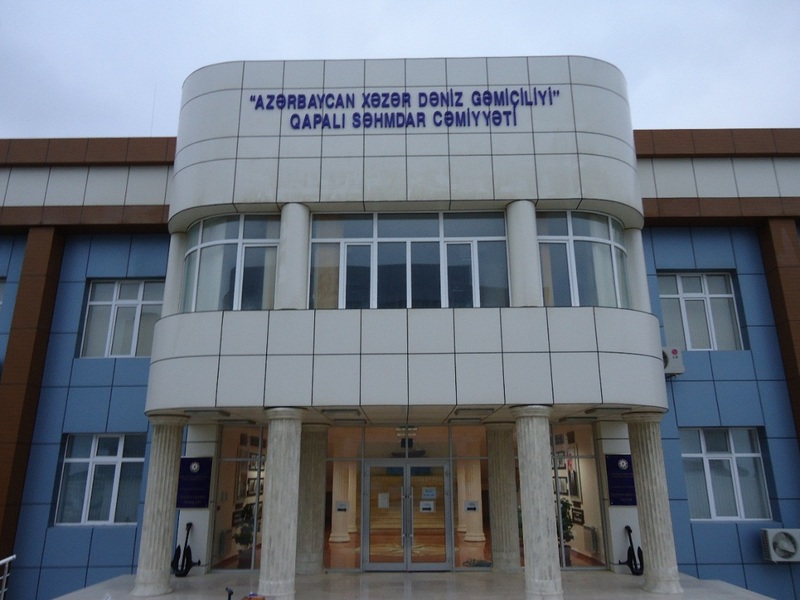 Currently, at the Azerbaijan State Maritime Academy, all educational stages (bachelor, masters, doctoral studies) have been upgraded to meet the highest standards of modernity. Today , not only the youth of the country, but students from Turkey, Georgia, Kazakhstan also studies At the Maritime Academy. “Caspian Shipping Company” always meets its needs for highly qualified personnel provided that preference is given to quality. The Company and its Chairman Rauf Valiyev always cares about ASMA which is the main source of personnel for “Azerbaijan Caspian Shipping Company” Close – Joint Stock Company. As a result of this care, the graduates distinguished in their studies are provided with employment (based on the issuance of recommendation letter) and career development, receive further education, as well as their social security is strengthened. Selected students of the Marine Academy are sent for summer sailing practice on board ships in the Black Sea every year in order to ensure development of the marine personnel trained in the Academy to the international standards. This may also include the opportunity for time-fixed education on account of “Azerbaijan Caspian Shipping Company” Close Joint Stock Company in the higher marine schools of the foreign countries by relevant selecting way high achiever and achiever students. The Academy always modernizes its material and technical potential and enriches its auditorium, laboratory and teaching cabin with the newest technical – teaching aids in order to train highly qualified seafarers. Academy focuses on improvement of teaching and strengthening of its relations in science and production at all times. All conditions have been created in the Academy for efficient activities of the teaching staff and students. That is, students studying in the Academy are provided with fully repaired and free hostels, meals twice a day, and spring – winter clothes. The hostel of the Academy has undergone capital repairs and put at the disposal of the students. There is an information - resource center supplied with numerous books in Azerbaijani, Russian and English related to profession of seafarer, a dining hall, sport halls, and a pool that will meet the needs of the students. The new building of the Marine Academy was also put at the disposal of students from 2016. 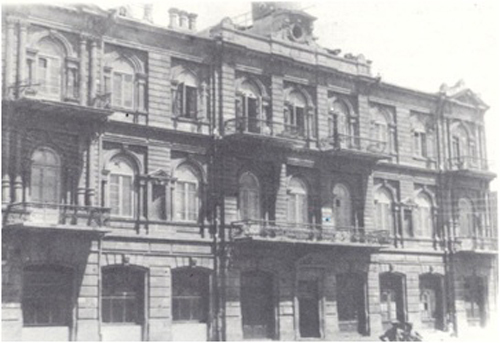 The four - storey building located at 127, Kazim Kazimzade str., underwent capital repair at the expense of Azerbaijan Caspian Shipping Company and its territory renovated. As per Resolution No. 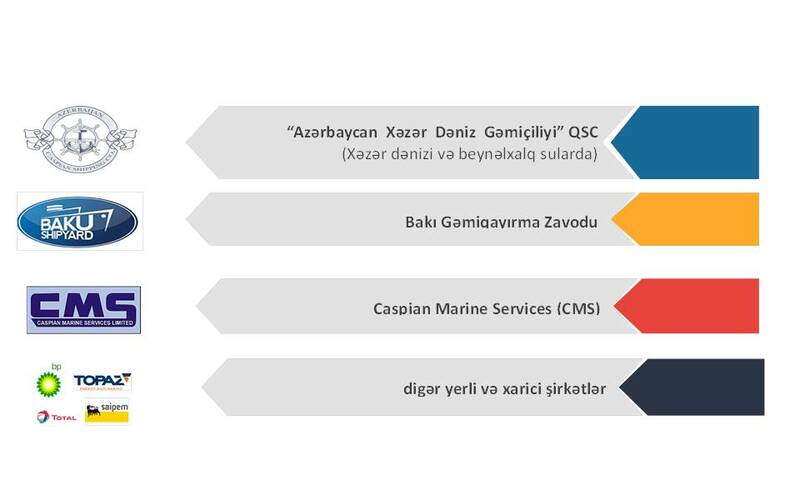 197 of the Cabinet of Ministers, the Marine – Fishing Industrial College of the Ministry of Education was assigned into subordination of “Azerbaijan Caspian Shipping Company” Close Joint Stock Company and renamed as Naval College under Azerbaijan State Marine Academy. Today, Azerbaijan State Marine Academy and naval College are open to students and continues operating successfully in the new academic year. Ch.M.Aliyev the Rector of ASMA who has made great efforts in a responsible and honorable direction in training of highly qualified professional personnel with modern outlook does not only create broad opportunities for our young students studying in ASMA, but also highly qualified graduates are admitted to the Academy year by year (number of those students scoring over 600 points who just choses ASMA grows year by year) as a result of improvement in education quality, performance data of the student contingent admitted to ASMA every year and their development from year to year, and a series of measures taken in preparation of student admissions. Governed by priority areas of government policy for youth, there operate a Scientific Society of Students, Student – Youth Organization, Student Trade Union Committee in the Academy. An evidence of these activities is the contest “Language - the Path towards career” held in ASMA between higher schools of the republic in which higher schools of our republic participate with support of the Ministry of Education of the Republic of Azerbaijan. So, ASMA which hosts this contest for the third time provides opportunities for young students of our republic to demonstrate their skills and knowledge. The young students of ASMA who are part of the Azerbaijani youth provided with comprehensive government care today make their contribution to the development of the society working diligently in “Converting oil revenues to human capital” as said by President Ilham Aliyev who is committed to Youth Policy of the National Leader with his decisions.